Friday the 13th brought the Soft Rock a collection of players exquisite and serene. Flusnoix headmistress Jess Marie Walker gave the floor to her fellow members of the improvisation collective, and welcomed renowned, expressive players in their wake. 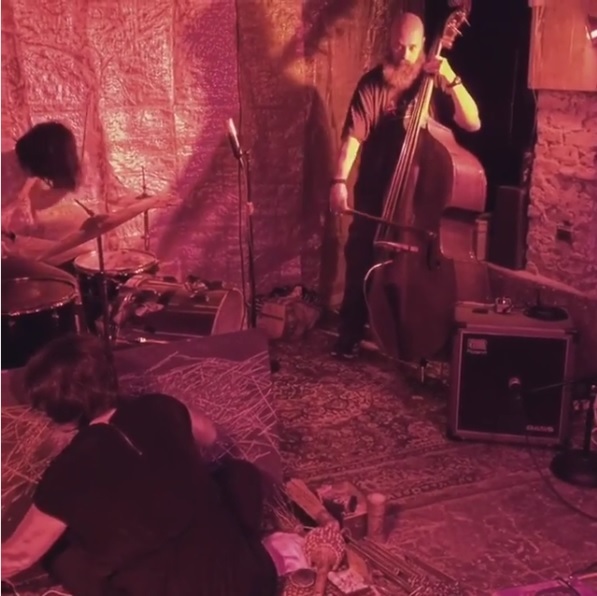 This time, Flusnoix was: Jess Marie Walker (fluxsound, vocal), Walker Yancey (drums), Rodney D. Hasty (submitted recording), Brent Stauffer (bass), Brad Davis (electronics), and Davey Williams (guitar). Second came Sailing Rumpus, a trio comprised of world-traveling virtuosos Misha Feigin (acoustic guitar and balalaika), LaDonna Smith (violin), and Davey Williams (electric guitar). Our third act was A Picture, the pairing of Majid Araim and Will Lackey, composers and meta-instrumentalists who performed two pieces: "Homage to Those Taken By Death" for violin and bowed percussion, and "Once in the Forest" for violin, banjo, extended marimba, vocal, and sound objects. To close the night, I joined the night's players with my saxophone to level the house with distinct and precise noises. Many warm thanks to all participants, and good luck to them on their travels of sound. Flusnoix members Jess Marie Walker, Walker Yancey, and Brent Stauffer during Session 1.